Give your clients more ways to sparkle this holiday season by offering the P+ Soak-off System featuring high-shine P+ soak-off glitter gel-polishes. 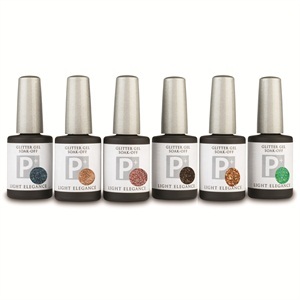 Give your clients more ways to sparkle this holiday season by offering the P+ Soak-off System featuring high-shine P+ soak-off glitter gel-polishes that incorporate the same highly concentrated glitters Light Elegance is known for. With an assortment of bold colors and glitters, the gel-polishes reach a desired opacity in one or two thin coats, are packed with pigment, have no pullback or shrinking, and can be worn for weeks. Find the proof in the packaging and see the actual product on a cured dot on every bottle of P+ color and glitter gel-polish. Follow these steps for an eye-catching party nail. 1. Prep and cleanse the nail with Light Elegance Cleanser. 2. Apply P+ Base Coat and cure for two minutes under a UV light or 30 seconds under an LED light. 3. Apply one thin coat of P+ gel-polish color. Cure for two minutes under a UV light or 30 seconds under an LED light. 4. Apply P+ glitter gel over the gel-polish color. Cure for two minutes under a UV light or 30 seconds under an LED light. 5. For the perfect shine, finish the glitzy look by adding a coat of P+ Top Coat. Cure for two minutes under a UV light or one minute under an LED light.